The much talked about documentary Man on Wire is about a man who breaks into rooftops of tall structures only to perform his ropewalking act on them. 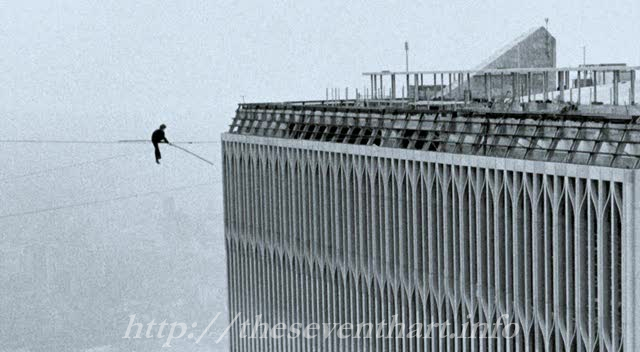 Specifically, it shows us Philippe Petit’s attempts to fulfill his cherished dream of walking between the twin towers of the World Trade Center on a wire. The film cuts to and fro between three time lines – Philip’s biographical history and his induction into this “crime”, hours before the actual event that is to occur, and the present year at the studio – and provides a seamless documentation of one of the most shocking moments in history. Mr. Marsh, the director, crosscuts facts presented as interviews with fictionalized forms of the same, shot in B&W. Man on Wire carries the tagline “The artistic crime of the century”. And in retrospect, each word of the tagline seems to resonate loudly. “Artistic” because of the discoveries it can make – of one’s own unlimited physical and mental strength and of one’s own limitations. “Crime” because how it all happened. More than the event itself, the preparations of the event are so dramatic that they can pass of as sequences from a top-notch heist film. And the last word of the tagline is a subtle tribute to the famous twin structure that the new century could never retain. Interestingly, the film never laments about the destroyed structure and sticks to what happened with Philippe alone. And that is a move of great confidence. As such, Man on Wire makes a great watch primarily because of the content it provides. There are pretty decent insights too into Philippe’s mind with respect to the death-defying act he performs. But I guess, even though it is lovingly directed, it may not go on to win the Oscar. True, that it throws a shiver down the spine but not more than the event itself. And kids, do not attempt this at home! The shock factor actually is not the main thing to trigger the adrenaline in my opinion. Despite its unparalleled risk, it is more poetic. A film encompassing that feeling even to a very minuscule degree is something truly ethereal. I loved the film and the way the music accompanied it. I assure you that you would love Encounters at the End of the world to a greater extent..